Grant, we pray, almighty God, that, always pondering spiritual things, we may carry out in both word and deed that which is pleasing to you. Through our Lord Jesus Christ, your Son, who lives and reigns with you in the unity of the Holy Spirit, one God, for ever and ever. Historically today is the feast of St. Julia of Corsica, also known as Saint Julia of Carthage, and more rarely Saint Julia of Nonza, was a virgin martyr. The date of her death is most probably on or after AD 439. She, along with Saint Devota, are the patron saints of Corsica. Saint Julia was declared a patroness of Corsica by the Church on August 5, 1809; Saint Devota, on March 14, 1820. Both were martyred in pre-Christian Corsica under Roman rule. It is also historically the feast of St. John Baptist de Rossi who was from Genoa, and studied and worked in Rome before becoming a priest there and a canon of Santa Maria in Cosmedin. He worked tirelessly for homeless women, the sick, prisoners and workers, and was a very popular confessor, being called a second Philip Neri. 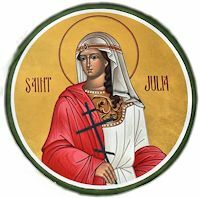 St. Julia was a noble virgin of Carthage, who, when the city was taken by Genseric in 489, was sold for a slave to a pagan merchant of Syria named Eusebius. Under the most mortifying employments of her station, by cheerfulness and patience she found a happiness and comfort which the world could not have afforded. All the time she was not employed in her master's business was devoted to prayer and reading books of piety. Her master, who was charmed with her fidelity and other virtues, carried her with him on one of his voyages to Gaul. Having reached the northern part of Corsica, he cast anchor, and went on shore to join the pagans of the place in an idolatrous festival. Julia was left at some distance, because she would not be defiled by the superstitious ceremonies which she openly reviled. Felix, the governor of the island, who was a bigoted pagan, asked who this woman was who dared to insult the gods. Eusebius informed him that she was a Christian, and that all his authority over her was too weak to prevail with her to renounce her religion, but that he found her so diligent and faithful he could not part with her. The governor offered him four of his best female slaves in exchange for her. But the merchant replied, "No; all you are worth will not purchase her; for I would freely lose the most valuable thing I have in the world rather than be deprived of her." However, the governor, while Eusebius was drunk and asleep, took upon him to compel her to sacrifice to his gods. He offered to procure her liberty if she would comply. The Saint made answer that she was as free as she desired to be as long as she was allowed to serve Jesus Christ. Felix, thinking himself derided by her undaunted and resolute air, in a transport of rage caused her to be struck on the face, and the hair of head to be torn off, and lastly, ordered her to be hanged on a cross till she expired. Certain monks of the isle of Gorgon carried off her body; but in 768 Desiderius, King Of Lombardy, removed her relics to Breseia, where her memory is celebrated with great devotion. St. Julia, whether free or a slave, whether in prosperity or in adversity, was equally fervent and devout. She adored all the sweet designs of Providence; and far from complaining, she never ceased to praise and thank God under all his holy appointments, making them always the means of her virtue and sanctification. God, by an admirable chain of events, raised her by her fidelity to the honour of the saints, and to the dignity of a virgin and martyr. Visit this website for pictures and information about St. Julia. St. John was born at Voltaggio in the Diocese of Genoa on February 22, 1698 and died at Rome on May 23, 1764. His parents, Charles de Rossi and Frances Anfossi, were not rich in earthly goods, but had solid piety and the esteem of their fellow-citizens. Of their four children, John excelled in gentleness and piety. At the age of ten he was taken to Genoa by friends for his education. There he received news of the death of his father. After three years he was called to Rome by a relative, Lorenzo de Rossi, who was canon at St. Mary in Cosmedin. He pursued his studies at the Collegium Romanum under the direction of the Jesuits, and soon became a model by his talents, application to study, and virtue. As a member of the Sodality of the Blessed Virgin and of the Ristretto of the Twelve Apostles established at the college, he led the members in the meetings and pious exercises, in visits to the sick in the hospitals and in other works of mercy, and merited even then the name of apostle. At the age of sixteen he entered the clerical state. Owing to indiscreet practices of mortification he contracted spells of epilepsy, notwithstanding which he made his course of scholastic philosophy and theology, in the college of the Dominicans, and, with dispensation, was ordained priest on 8 March, 1721. Having reached the desired goal, he bound himself by vow to accept no ecclesiastical benefice unless commanded by obedience. He fulfilled the duties of the sacred ministry by devoting himself to the laborers, herds, and teamsters of the Campagna, preaching to them early in the morning, or late in the evening, at the old Forum Romanum (Campo Vaccino), and by visiting, instructing, and assisting the poor at the hospital of St. Galla. In 1731 he established near St. Galla another hospital as a home of refuge for the unfortunates who wander the city by night ("Rom. Brev. ", tr. Bute, Summer, 573). In 1735 he became titular canon at St. Mary in Cosmedin, and, on the death of Lorenzo two years later, obedience forced him to accept the canonry. The house belonging to it, however, he would not use, but employed the rent for good purposes. For a number of years John was afraid, on account of his sickness, to enter the confessional, and it was his custom to send to other priests the sinners whom he had brought to repentance by his instructions and sermons. In 1738 a dangerous sickness befell him, and to regain his health he went to Cività Castellana, a day's journey from Rome. The bishop of the place induced him to hear confessions, and after reviewing his moral theology he received the unusual faculty of hearing confessions in any of the churches of Rome. 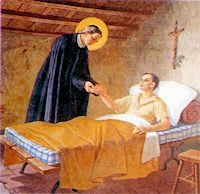 He showed extraordinary zeal in the exercise of this privilege and spent many hours every day in hearing the confessions of the illiterate and the poor whom he sought in the hospitals and in their homes. He preached to such five and six times a day in churches, chapels, convents, hospitals, barracks, and prison cells, so that he became the apostle of the abandoned, a second Philip Neri, a hunter of souls. In 1763, worn out by such labors and continued ill-health, his strength began to ebb away, and after several attacks of paralysis he died at his quarters in Trinità de' Pellegrini. He was buried in that church under a marble slab at the altar of the Blessed Virgin. God honoured his servant by miracles, and only seventeen years after his death the process of beatification was begun, but the troubled state of Europe during the succeeding years prevented progress in the cause until it was resumed by Pius IX, who on 13 May, 1860, solemnly pronounced his beatification. As new signs still distinguished him, Leo XIII, on 8 December, 1881, enrolled him among the saints.